Since 1989, the Spanish Antarctic Program has done monitoring at Deception during austral summers. This work is carried out by researchers from University of Granada and University of Cádiz, Spain, in collaboration with other institutions. There was no recorded seismicity, deformation, or soil temperature flux during late 2008-early 2009 (BGVN 34:03). However, the 2014-15 survey noted sustained deformation and increased seismicity. The instrumental network was basically the same in use since 2008 (figure 22). Researchers deployed a temporary seismic network made up of five three-component, short-period seismic stations and a small-aperture seismic array (Carmona et al., 2014). Figure 22. Locations of the instruments of the monitoring network at Deception Island and surroundings. Green triangles are permanent seismometers; blue triangles are temporary seismometers; red dots indicate deformation & temperature measurements. Courtesy of the Spanish Antarctic Program. Data was transmitted to the "Gabriel de Castilla" Spanish Base where it could be analyzed in real time. These instruments usually operate between early December and late February. The researchers also ran three permanent broadband seismic stations at Livingston Island, Deception Island, and Cierva Cove, which have been operating continuously since February 2008. Deformation measurements were obtained with three GPS stations and an EDM, together with Wi-Fi transmission and real-time analysis (Peci et al., 2012). A temperature sensor was deployed at CECA (Cerro Caliente). Variations in distance between GPS stations since 2013 revealed a steady increase in distance of ~5 cm/year (figure 23). The 2014-2015 survey shows an accumulated deformation of 10 cm. The pattern of deformation suggests inflation in response to a pressure source under Port Foster. Figure 23. Variations in distance between GPS stations BEGC and PEND from 2013 to 2015. Courtesy of the Spanish Antarctic Program. The seismic activity between 1994 and 2011 has been described by Ibáñez et al. (2000, 2003a) and Carmona et al. (2012). Two types of seismicity are generally detected. Tectonic and volcano-tectonic (VT) earthquakes are characterized by wide-band signals related to the occurrence of fractures in the medium. Long-period (LP) seismicity is characterized by narrow-band signals that include both isolated events and volcanic tremor, and are often interpreted as a consequence of interactions between solids and hot fluids in volcano environments. Between the 1999 VT earthquake series (Ibáñez et al., 2003b) and 2011, the seismic activity has been relatively quiet, with occasional peaks of activity, for example during the 2003-2004 survey (Carmona et al., 2012). This trend continued until the 2012-2013 survey, when a larger number of both LP and VT events were detected. (figure 24). Figure 24. Comparison of the daily number of seismic events (long-period at left, volcano-tectonic at right) recorded during summer surveys since 2009-2010. The gray bands indicate the duration of the survey. Note the change in the scale of the y-axis during 2012-2013 and 2014-2015. Courtesy of the Spanish Antarctic Program. During the 2013-2014 survey seismicity seemed to be quite low, but the data covered barely one month. During the 2014-2015 survey, seismic activity was very intense (figure 24). The total number of events recorded was an order of magnitude larger than in previous years, and by far the most active survey since the unrest in 1999. The high level may be related to the deformation previously noted. LP seismicity was detected mainly at the FUM and OBS stations, on the western shores of Port Foster. The array analysis suggests that the source of this seismicity lies on the western side of the island. Tectonic and volcano-tectonic earthquakes were common, but most were too small to be recorded adequately over the entire network, so could not be located. One cluster was centered SE of Livingston Island, which was active during the whole survey. Another cluster was located SW of Deception Island, with the remainder at distances of 5-20 km. The closest events occurred during the last weeks of the survey, which led researchers to recommend a change in the hazard status. The Spanish Polar Committee raised the volcanic alert level to yellow for a few days in February 2015. References: Berrocoso, M., Fernández-Ros, A., Ramírez, M. A., Salamanca, J. M., Torrecillas, C., Pérez-Peña, A., Páez, R., García-García, A., Jiménez-Teja, Y., García-García, F., Soto, R., Gárate, J., Martín-Dávila, J., Sánchez-Arzola, A., De Gil, A., Fernández-Prada, J. A. & Jigena, B. (2008). Geodetic research on Deception Island and its environment (South Shetland Islands, Bransfield Sea and Antarctic Peninsula) during Spanish Antarctic campaigns (1987-2007), in: Geodetic and Geophysical Observations in Antarctica, A. Capra, R. Dietrich (eds. ), pp. 97-123. Carmona, E., Almendros, J., Serrano, I., Stich, D., Ibáñez, J. M. (2012). Results of seismic monitoring surveys of Deception Island volcano, Antarctica, from 1999-2011, Antarctic Science, 24, 1-15, doi:10.1017/S0954102012000314. Carmona, E., Almendros, J., Martín, R., Cortés, G., Alguacil, G., Moreno, J., Martín, B., Martos, A.,Serrano, I., Stich, D., Ibáñez, J. M. (2014). Advances in seismic monitoring at Deception Island volcano (Antarctica) since the International Polar Year, Annals of Geophysics 57(3), SS0321, doi:10.4401/ag-6378. Ibanez, J. M., Del Pezzo, E., Almendros, J., La Rocca, M., Alguacil, G., Ortiz, R., Garcia, A. (2000). Seismovolcanic signals at Deception Island volcano, Antarctica: wave field analysis and source modeling, J. Geophys. Res., 105, 13905-13931. Ibáñez, J. M., Almendros, J., Carmona, E., Martínez-Arévalo, C. & Abril, M. (2003a). The recent seismo-volcanic activity at Deception Island volcano. Deep-Sea Research II, 50, 1611-1629. Ibanez, J. M., Carmona, E., Almendros, J., Saccorotti, G., Del Pezzo, E., Abril, M., Ortiz, R. (2003b). The 1998-1999 seismic series at Deception Island volcano, Antarctica, J. Volcan. Geotherm. Res., 128, 65-88. Peci, L. M., Berrocoso, M., Páez, R., Fernández-Ros, A., de Gil, A. (2012). IESID: Automatic system for monitoring ground deformation on the Deception Island volcano (Antarctica). Computers & Geosciences, 48, 126-133. Information Contacts: Javier Almendros, Enrique Carmona, Vanessa Jiménez, Alejandro Díaz, and Francisco Lorenzo, Instituto Andaluz de Geofísica, University of Granada, Spain; Manuel Berrocoso, Amós de Gil, Alberto Fernández-Ros, and Belén Rosado, University of Cádiz, Spain. The Global Volcanism Program has no Weekly Reports available for Deception Island. Volcanic eruptions built a small island, 900 m long, 250 m wide, and 120 m high, with three craters each approximately 200 m in diameter above water surface. Prior to eruptions, location had a measured depth of 55 fathoms, indicating an uplift and building of some 300 feet subsurface and 360 feet above the surface, for a total of 660 feet. There are marine sediments from the bottom of the bay that had been uplifted by the phenomenon. The following reports, ordered by report number with activity dates in brackets, were issued during 16-19 February 1968. On 4 December 1967 at 2000Z there was an undulatory movement of the surface, followed by three major explosions at 2230Z, 2330Z, and approximately 2340Z. The activity ceased approximately 8 December 1967. There were three groups on the island at the time of the eruption, from Chile, England, and Argentina. The Argentines were from the Argentine Antarctic Institute, Cerrito 1248, Buenos Aires. This same institute had two men on the island for 15 days after the eruption. They presently have four men on the ship to Deception Island that will depart Ushuaia during the last week of February 1968 to remove all personnel. The new volcanic activities took place in the northern part of Puerto Foster between Caleta Pendulo and Bahia (Bay) Telefon, about 10 km from the Argentine Naval Detachment and the English base, and less then 5 km from the Chilean base. The Argentine Naval Detachment did not suffer any damages and the vents close to it were not modified, the English base is intact and closed, but the Chilean base was almost destroyed. The volcanic events formed an island in Bahia Telefon with three craters, and a crater and a zone of vents on the coast between the bay and Caleta Pendulo. The new island is about 900 m long, 250 m wide, and 120 m high with three craters approximately 200 m in diameter which contain water and eject columns of vapor which reach a height of 300 m. One of the craters is connected to the sea and its water is yellow, while the waters in the other two are of light green color. The temperature of those waters oscillate between 42 and 60°C, and the sea water surrounding the new island is about 7-10°C. The island is formed by marine sediments from the bottom of the bay that had been lifted by the phenomenon. Toward the northeast of Caleta Pendulo and on the coast, about 4 km from the Chilean base, a new crater was formed with a diameter of approximately 450 m which emits vapor to a height of 300 m, the color of the water it contains is light green and its temperature is 50°C. In the lips of this crater there is a series of fissures through which the vapor escapes at a temperature of 100°C. To the northeast of this place and at a distance of 300 m, an area approximately 300 m in diameter of new vents, which also emit vapors of 100°C, has appeared. Geological samples of the new island and samples of the gases and the vapor sediments from all the craters and vents have been collected. They are being analyzed now at the Argentine Antartic Institute. There are, in the same institute, samples of volcanic ash that were collected during the eruption on board the Argentine vessel Bahia Aguirre. Information Contacts: Event Notification Report (08 February 1968)Sidney Galler, SI; New York Times (7 December 1967); Science News (6 January 1968). Information Report Number 1 [04 December 1967]Argentine Navy Base, Ushuaia, Argentina. Information Report Number 2 [06 December 1967]Carlos A. Perticarari, Instituto Antarctico Argentino. The following report is an extract from Valenzuela and others (1968) from the Department of Geology, University of Chile. An English translation made by Carmen Ava Oliveras, Betty Counts, and Mort D. Turner, was provided by K.G. Sandved. Seismicity. The seismograph at Presidente Aguirre Cerda (PAC) base on Deception Island recorded a notable increase in seismic activity during November 1967. The 'normal' rate (4-30 events per month, maximum intensity II) rose to 300 events/month, climaxed on 4 December by two quakes of intensity V. After 1500 hours on this day, quakes of intensity V occurred at an average rater of 4-5/minute. Eruption of 4-5 December 1967. At 1840 (local time) on 4 December, PAC base personnel witnessed a column of black ash being ejected through the sea ice that partially covered Telefon Bay. This column reached a height of 2,500 m, and expanded laterally. The sea within Pendulum Cove began to boil and a strong odor of sulfur was detected. An oscillatory movement of sea-level in this cove has a period of 2-3 minutes and an amplitude of 1.5 m.
Later the ash cloud originating from Telefon Bay reached over PAC base causing total darkness. There was a shower of ash and cinders ranging up to 10 cm diameter. Incandescent blocks about 1 m across were falling back through the ice-cover of the bay. Strong subterranean noises were continuous, and there was sporadic electrical discharge. Observers on the ship Piloto Pardo, then 10 km NE of the island, saw the ash cloud as a curtain with an E-W orientation, probably related to the prevailing NNW winds (15-20 knots velocity). The duration of maximum activity lasted from 1840 to 1930 (local time) on 4 December. This was followed by a period of relative calm. On 5 December, during rescue and evacuation of personnel on the island, a light-gray column of ash was observed in the Port Foster area. At 1035 hours on 6 December a Chilean Air Force plane observed a new island in Telefon Bay, from which pyroclasts were being thrown up to 300 m high, and a steam cloud rising more than 6,000 m high. A new crater had also formed near Refugio Telefon on the main island, from which steam rose 10,000 m high. On 14 December the crew of the ship John Biscoe observed activity from both these craters; since then, reports have been confined to strong fumarolic activity only. Morphological changes at Telefon Bay. The accumulation of ejected material on the submarine platform of the bay formed a new volcanic island composed of three principal craters and one satellite crater: Western Crater, 100-m-diameter, 10 m elevation; Main Crater, 170-m-diameter, 70 m elevation; Eastern Crater, 90-m-diameter, 30 m elevation; and Satellite Crater, 10-m-diameter, 40 m elevation. The island as a whole, named Yelcho Island, is oval in outline and measures 930 m (NE-SW) by 200 m (NW-SE). To the immediate east of the eastern crater lies a shoal rising ~1 m above sea level with a visible diameter of 35 m. An exploratory bathymetric survey of Telefon Bay by the Chilean Naval Vessel Yelcho revealed no other significant morphological changes on the sea-floor. Morphological changes at Refugio Telefon. The superficial cover around Refugio Telefon is composed of slope wash, fluvioglacial sand and gravel, and ice densely loaded with gravel. All of this mass rests in the Telefon Bay area over andesites, agglomerates, and basalts of the Port Foster Group (Hawkes, 1961). Because of the eruption, the superficial cover underwent a process of compression and compaction which gave rise to a system of fissures at the contact with the underlying strata, because the differences in strength of the units. On land, the morphological expression of this phenomenon is a stepped relief, with a difference of several centimeters between each step, that was recognized along a narrow belt 1,500 m long. The compaction of the material caused two lakes to join north of the Refugio, thus forming a basin 750 m long by 200 m wide. In the central depression of a great erosion amphitheater, formed by the union of four ravines, an explosive crater (diatreme) appeared which, because of a later invasion of the waters from Port Foster, formed a maar. The predominant winds during the eruption influenced the distribution and deposition of the fine pyroclastic material, which covered approximately two-thirds of the total surface of Deception Island with a layer of ash and lapilli to an average thickness of 50 cm. Summary. Summarizing briefly the characteristics of the eruption, activity has been concentrated at four new conduits situated on a semi-circular line 2,500 m long. The largest part was located on the submarine platform of Telefon Bay, at 70 m below sea level. The accumulation of the expelled material, mostly of the fragmental type, gave rise to a new island formed by the union of three pyroclastic cones, composed primarily of scoria and ash. The fourth center of eruption is found on the coastline at the E end of the bay and essentially corresponds to a diatreme invaded by waters from the sea, resulting in what must be considered a maar. Reference. Valenzuela, E., Chavez B., L., and Munizaga V., F., 1968, Informe preliminar sobre la erupcion de Isla Decepcion ocurrida en Diciembre de 1967: Bulletin Instituto Antartico Chileno, v. 3, p. 5-16. Information Contacts: Instituto Antartico Chileno; K.G. Sandved, National Science Foundation, USA. 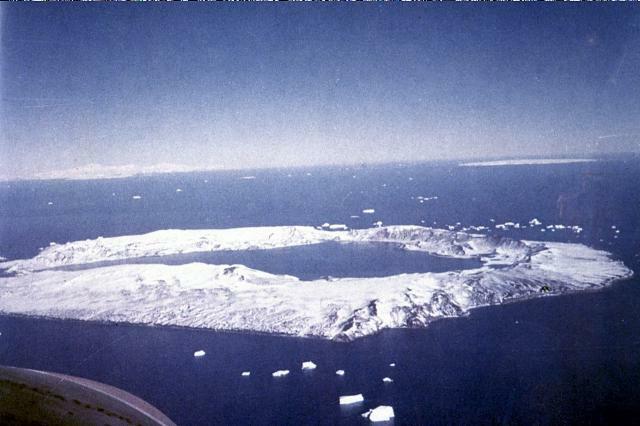 "Regarding possible structural changes in Deception Island as a consequence of the earthquake which occurred on 17 September 1968, I am pleased to inform the Director than the Argentine Naval outpost located on the island was not occupied during the winter of 1968, but a recent aerial observation made on 5 November made it possible to establish the following. The island maintains its usual appearance, it not having been possible to observe particular cracks for the island being completely covered by a heavy blanket of snow which made it impossible to see structural changes. The new marine isle Suarez with its three craters which surfaced out of the volcanic event of 1967 shows no activity whatever. The mouths of the crater situated on the inlet Pendulo continued to emit water vapor." Information Contacts: Carlos A. Perticarari, Captain of the Navy, Secretario General; Instituto Antarctico Argentina. "Violent earthquake has destroyed British Base on Deception Island. First shock 21 February at 0630 GMT. Main shock at 1245 GMT same date. Brought down ice avalanche on British Station. Personnel evacuated safely by Chilean helicopters 22 February. Daily tremors beginning 14 February increased in intensity until eruption 0043 GMT on 21 February. Eruption occurred behind Chilean Research Station. First observed as black cloud, no fallout then white cloud rising to 10,000 feet with fallout depositing 1-2 inches pumice and ash on island. Chilean base and British hut destroyed. 100 holes in British hangar from volcanic bombs. Eruption caused heavy seas 20 knots wind in Port Foster. Earthquake associated with volcanic eruption: origin time, 0632 22 seconds GMT; latitude: 63°S, longitude, 60°W; magnitude: 5.3 Richter, depth of focus, normal. Information Contacts: Card 0423 (27 February 1969)K.G. Sandved, National Science Foundation, USA. Card 0424 (27 February 1969)Carl Von Hake, US Coast & Geodetic Survey. The following report was transmitted to the Center by K.G. Sandved, Polar Information Services, Office of Antarctic Programs, National Science Foundation. During 2-5 March 1969, our research vessel Hero made a reconnaissance of Deception Island to assess the effects of the latest volcanic eruption. Aboard the vessel was K.R. Everett, a geologist from Ohio State University, who has submitted the following teletype summary of his observation. "The vent area was examined. There are three centers of activity, the largest of which is located behind the Chilean research station. Heavy fumarole activity on 1 and 2 March, and during the morning of the 3rd, decreased on 4 and 5 March. "A rift through the glacier, 200-250 feet deep and in three segments, was observed. The British station was heavily damaged by mudflow, and the graveyard and much of the whaling station were destroyed. Kroner Lake, which used to be landlocked, has opened to the sea. The mudflow depth was 4-7 feet, while the scoria cover amounted to 1-2 inches. Mudflow in the Whalers Bay area was quite liquid and appeared to have been rapid moving (20-30 mph), the final phase being largely water accompanied by considerable down-cutting. "The Chilean station was completely destroyed by a combination of ashfall and mudflow scoria 5 inches to several feet deep. Large bombs were observed near the vent. Water vapor and hydrogen sulfide gas were present, and elemental sulfur was being deposited from numerous small fumaroles and vents. The ground temperature on the hillside behind the Chilean station fluctuated between 50 and 70°C. Steam rising generally on the hillside; steam and boiling water issuing at sea level along Pendulum Cove was largely from the glacier and the snow. "Fumarole activity in the 'Fumarole Bay' area up the coast was intense on 3 March until about 1600 GMT. There was sulfur deposition along parallel tracks, and steam and boiling water (100°C) was issuing at sea level. Yelcho Island (1967 cone) was quiet, but carbon dioxide and/or hydrogen sulfide was bubbling in the lake. "The Argentine station was unharmed, but a thin coating of ash lay over the station and most of the west coast including the ice cap. The west beach was heavily littered with timber, food cans, fuel drums, and at least one grave marker, most of the materials coming from the Whalers Bay area. Inland up to the ice cap, the ash cover formed a coat of one-quarter inch that was locally thicker in depressions. "The largest mudflow occurred to the north of Penfold Point. It carried large block of glacier ice and bedrock blocks weighing several tons to the coast. Similar-size material was involved at and near the Chilean station, and a few very large blocks were involved at the British station. A gas sample was taken above the Chilean station, and numerous photographs were obtained. Seismic records were obtain by the British before and during the expedition." Information Contacts: K.R. Everett, Ohio State University. "On December 21 and 31, 1967, a limited survey of the bottom was carried out by the authors to observe the effects of the volcanic events of December 4 on the benthic fauna of Port Foster. Fifteen 0.1 m2 and one 0.2 m2 Petersen grab samples, and five dredge hauls gave evidence that most of the bottom had been covered by a layer of ash at a minimum thickness of 30 cm. Bottom samplers caught little if no infauna in the greater part of Port Foster and dredgings from the same area showed no residues of the previously existing infauna. Comparison with yields from samples taken on a previous year at Port Foster and outside the bay gave an idea of the extent of the mortality. "Near the mouth of Port Foster, where the bottom does not show considerable ash covering, infaunal animals were more numerous. A dredge haul here caught many specimens of living Ophionotus victoriae, together with some dead ones. Also all Echinoidea (Sterechinus neumayeri) were dead and in advanced state of decomposition. Mortality in this case was presumably due to other chemical or physico-chemical factors. Other causesof mortality in the bottom of Port Foster were: the uplift of the bottom and the formation of a new islet at Telefon Bay, the high concentration of toxic compounds, and the high temperature reached by the water nearby. "Further alterations of the ecosystem at Port Foster were evidenced by the absence of fish and other sea life at the time of the observations. Turbidity of the water and the presence of toxic compounds might have also altered the productivity of the surface layers. Port Foster is now an excellent spot to study the reestablishment of an ecosystem in relation to the evolution of all parameters to normality." Information Contacts: V.A. Gallardo and J.G. Castillo, (no affiliation provided on card). "The U.S. Antarctic Research Program, Washington, D.C., received the following report on 13 August 1970 from John Croom, U.S. Exchange Scientist wintering over with the Russians at Bellingshausen Soviet Station, Antarctic Peninsula (62°12'S, 58°56'W). High possibility that volcanic eruption occurred this area on 12 August perhaps Deception Island. 100% area here covered with volcanic ash with strong sulfur odor early morning 13 August 1970. Deception located 110 km on heading 226° from Bellingshausen. At 0000Z, 13 August 1970 radio zone here showed wind at 1 km altitude from 110° at 20 m/s, 8 km altitude from 180° at 20 m/s 32 km altitude from 270° at 60 m/s. Mean surface wind throughout night 12 August and morning of 13 August 350° at 5 m/s. Arturo Prat Station reports heavy ash and sulfur odor. O'Higgins and Petrel Stations reported electrical storm in direction of Deception Island in morning of 13 August 1970. First report of ash fell here at 0810 to 0825Z. Have made photos of fallen ash and preserved ash samples." The following cable was received from R. Adie on 17 August 1970. "Eruption confirmed early morning 13 August." The following was received from E. Honeywell by telephone on 18 August. "We don't really know details of the eruption as nobody has gone to Deception. We think that there was one large eruption on the 12th and then there is a record of another base at the Argentine Islands who have indicated that there were 50 small episodes on the 13th. Our Stanley office in the Falkland Islands received confirmation from three other bases; the British base at the Argentine Islands, the Argentine base at Petrel, and also from Bellingshausen (the wind was blowing in their direction and the ash was blown right across), and we have a seismograph of the Argentine Islands. They recorded the shock but no ship has been to look because it is still wintertime and it is also too early for flying as the season hasn't started yet. Until a ship goes there we can't really confirm what has happened but there are indications of 100% ash cover. There is no doubt that there has been an episode, quite definitely; one large bang on the 12th followed by smaller eruptions on the 13th." "10 m2 ash sampled here has weight 649.8 ± 1 g. 10 m2 ash sampled from Arturo Pratt on Greenwich Island has weight 3 kg and was distributed at depth of 4 mm. There was no ash fall here in 1969 Deception eruption. No info available for 1968 eruption." Information Contacts: Card 0990 (14 August 1970)John Croom, U.S. Exchange Scientist, Soviet Bellingshausen Station, Antarctic Peninsula; Walter Seelig, National Science Foundation, USA. Card 0991 (14 August 1970)Raymond Adie, Univ. of Birmingham, England; Eleanor Honeywell, British Atlantic Survey, London, England. Card 0995 (24 August 1970)John Croom, U.S. Exchange Scientist, Soviet Bellingshausen Station, Antarctic Peninsula; Walter Seelig, National Science Foundation, USA. The following cables were received from the American Embassy in Santiago. "Chilean Antarctic Institute received wireless report black sand rain from base Prat on 13 August 1970 presumably due to volcanic eruption. Exact location and date eruption unknown so far. Samples were taken but will become available for analysis only after Chilean Antarctic team relieved December 1970." "Antarctic Base O'Higgins, situated approximately 170 km from Deception Island, registered seismic movement 'greater than usual' 12 August at 174330 GMT. This combined with reported ash rain leads Dr. Lorca, Department Geophysics, University Chile, conclusion volcanic eruption on Deception Island." "Using the information on your postcards about this eruption, particularly regarding the depth of the dust deposit and the magnitude of the explosion, which sent some of the dust well into the stratosphere, though only the lower stratosphere, I have now made a preliminary computation of the dust veil index for this eruption which is probably the most important eruption in the last three years or so. It seems that the Dust Veil Index will be somewhere in the range between 150 and 500 (Krakatau 1883 eruption equals 1,000; Bali 1963 eruption equals 800). The duration of the veil, judging from the probable height to which most of the dust reached, seems likely to be 1-2 years. Although dust from this eruption may eventually be detected also over the northern hemisphere, the effectiveness of the eruption in terms of a dust veil dense enough to affect the intensity of solar radiation is likely to be limited to latitudes between 30 and 90°S." Information Contacts: Card 1001 (01 September 1970)Scientific Attache, American Embassy, Santiago, Chile. Card 1013 (21 September 1970)H.H. Lamb, British Meteorological Office, Berkshire, England. Infrared imagery from the NOAA 10 polar orbiting weather satellite on 23 July at about 1300 GMT showed a plume that extended ~100 km SE from Deception Island. In early August, personnel on King George Island reported that seismic instruments at the Chinese "Great Wall" station, 110 km from Deception Island, had recently detected local seismicity, but gave no date or time. During an 11 August overflight, no volcanic activity was evident on Deception Island [see also 13:02]. Information Contacts: W. Gould, NOAA; G. Gutheridge, National Science Foundation. International volcanological expeditions organized by the Instituto Antártico Argentino and the Vulcantar Project, Univ Nacional de Salta, visited Deception Island in January-February 1987 and 1988. Local and regional seismicity, thermal activity, and gas emission were monitored, and eruptive mechanisms were investigated, particularly for the 1842, 1967, 1969, and 1970 eruptions. Previous field work by Argentine scientists at Deception Island was during the austral summers of 1971-72, 1972-73, 1973-74, and 1974-75. The 1988 expedition found no evidence of recent eruptions. 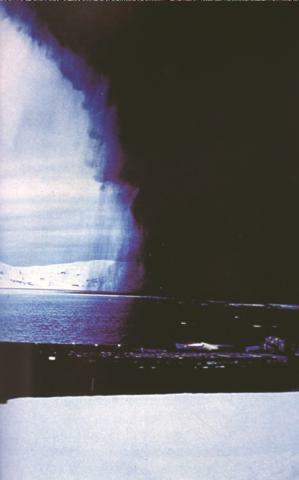 Observers from Bellingshausen Base (USSR), 160 km NE, noted the possibility that a shallow submarine eruption could have occurred. Frequent small (mb 0.5) earthquakes were centered ~8 km from the expedition's base camp. These earthquakes were particularly numerous along the 5-km 1969 eruption fissure. Episodes of volcanic tremor with well-defined frequencies and durations of 5-40 minutes were also recorded. Strong regional earthquakes centered 40-80 km from Deception Island and possibly related to the extensive Mar de la Flota (Bransfield Strait) structure seemed to trigger local seismic activity. No significant differences between the 1987 and 1988 seismic data were observed. The distribution of fumarolic activity (90-100°C) was also unchanged. Gas emission was prevalent in the S portions of the main fissure systems on the island, while conductive processes seemed to explain the temperatures of surface water bodies in the N sector. Information Contacts: J. Viramonte, Univ Nacional de Salta, Argentina; R. Ortiz Ramis, Museo Nacional de Ciencias Naturales, Spain; M. Martini, Univ di Firenze, Italy. Spanish and Argentine scientists visited Deception Island in December 1988 and January-February 1989. Local and regional seismicity, thermal activity, gas emission, magnetic field, geodetic, and geological studies were carried out, and the Spanish oceanographic vessel Las Palmas operated in the area. Previous work at Deception by the Vulcantar project was during the austral summers of 1986-87 and 1987-88. During the 1988-89 field season, an array of six seismic stations was installed on Deception Island, plus a single instrument at Spain's Juan Carlos I facility on Livingston Island (figure 1). More than 2,000 events were monitored, with more than 1,000 digitally recorded. The distribution of events showed a good correlation with tectonic features on and near the island. Seismic swarms and episodes of volcanic tremor with well-defined frequencies and durations of 5-360 minutes were also recorded. Small changes were observed in the distribution of fumarolic activity and thermal fields, with some impact on the local fauna. Figure 1. Distribution of seismic events in the vicinity of Deception Island, austral summer 1988-89 (top). Best-located seismic events near Deception Island during the same period (middle); new land built by the 1970 eruption is shaded. The inset box indicates the area shown in the map below. Detail of the Fumarole Bay area (bottom) showing seismic events 1-31 January 1989 (circles), sites of fumarolic activity (asterisks), and seismic stations (triangles). Courtesy of Ramón Ortiz. Information Contacts: R. Ortiz, Museo Nacional de Ciencias Naturales, Spain; J. Sastre, Real Instituto y Observatorio de la Armada, Spain; C. Parica, Ciudad Universitaria, Buenos Aires, Argentina; J. Viramonte, Univ Nacional de Salta, Argentina. "Spanish scientists visited Deception Island in December 1989 and January-February 1990. A geophysical station is located on the island and the Spanish oceanographic vessel Las Palmas operated in the area. Geological, tectonic, and geophysical features on and near the island were investigated. A regional, higher precision GPS geodetic network spans the Deception section of the Bransfield Rift. "During the 1989-90 field season, an array of six digital seismic stations was installed on Deception Island. More than 1,000 events (0.5-2.1 mb) were digitally recorded. The major shocks were located in de Neptune Bowels (S of the island). The distribution of events shows a good correlation with tectonic features on and near the island (figure 2). A low seismic velocity, high-attenuation body was inferred under the NE sector of the island. A negative magnetic anomaly (-4,900 nT) is located in the same area. Figure 2. Distribution of seismic events (circles) recorded by the Spanish Antarctic Program seismic array (triangles) on Deception Island, 20 January-20 February 1990. "Chemical compositions of samples from fumaroles and thermal springs suggest a thermal anomaly related to an underlying magma body. Gas geothermometry shows a formation temperature >250°C, with an outflow temperature of about 100°C. The phreatomagmatic character of the recent episodes is hypothesized as the result of a magma intrusion into shallow and confined water-saturated layers. "A permanent seismic station monitoring the seismic activity in the area has been established at Spain's Juan Carlos I facility (35 km from Deception)." Information Contacts: R. Ortiz, Museo Nacional de Ciencias Naturales, Spain; Rafael Soto, Real Instituto y Observatorio de la Armada, Spain. "Spanish-Argentine volcanological, geophysical, and geodetic scientists visited Deception Island during the 1990-91 austral summer (28 November 1990-13 March 1991) to provide measurements of the background activity. The present activity generally has remained unchanged from previous years. "A digital microseismic network was installed to record the local and regional seismic activity for 3 months (figure 3). On 14 January, a M 3.2 earthquake was recorded on the NE sector of the island. After this event the seismic activity changed dramatically compared to that recorded during the previous 4 summers, increasing in magnitude and decreasing in frequency. In general, the epicenters are related to the 1970 eruption vents and they are associated with the fissure system (figure 4). Episodes of volcanic tremors were also recorded in Fumarole Bay. Figure 3. Daily number of seismic events recorded by a temporary digital microseismic network at Deception Island, 14 December 1990-23 February 1991. Courtesy of Ramón Ortiz. Figure 4. Epicenters of earthquakes (mb >1.2) recorded at Deception Island, 1 December 1990-23 February 1991. Courtesy of Ramón Ortiz. "During the 1990-91 fieldwork, more than 300 gravimetric measurements were carried out, the magnetic map of the island was completed, and temperatures in fumaroles and hot soils were monitored. A volcanologically oriented GPS network was established and four GPS benchmarks (Argentine Station, Pendulum Cove, Fumarole Bay, and Whalers Bay) were measured with double-frequency receivers. Finally, three dry-tilt stations were installed in Telefon Bay (1970 eruption area), Crater Lake (1842 eruption sector), and Fumarole Bay. "The Spanish Oceanographic vessel Las Palmas recorded water temperature and salinity distribution in Port Foster. An area of anomalous temperature was detected in the central part of the caldera." Information Contacts: R. Ortiz, Museo Nacional de Ciencias Naturales, Spain; J. Viramonte, Univ Nacional de Salta, Argentina; R. Soto, Real Instituto y Observatorio de la Armada, Spain. The following is from José Viramonte. A dramatic change in volcanic and seismic activity at Deception Island has taken place after the M 3.2 earthquake of 14 January 1991. Significant volcano-tectonic changes, possibly related to a magmatic intrusion, were found during the 1991-92 austral summer by the Argentinian/Spanish expedition (VULCANTAR project), principally around the Argentine station area on the SW side of the island (figure 5). The group found, from early December 1991 to February 1992, three larger earthquakes (to M 3.5), many microseismic swarms (to 100 microearthquakes/day, around M 1), long periods (up to 3 hours) of volcanic tremor, the development of new fumarole fields, increased fumarole temperatures, and visible uplift. The scientific team was partially evacuated on 19 January because of the increased activity. The rest of the expedition will return by the end of February. Figure 5. Sketch map of Deception Island, showing the area of uplift and new fumarole fields, early 1992. Courtesy of J. Viramonte. Continuous real-time monitoring is provided by a 3-component seismic station, LaCoste gravimeter, and magnetometer (all linked to a computer system) and a volcanological GPS geodetic net. Argentinian, Spanish, and British vessels are on alert in case of an eruption. The last documented eruption of Deception Island, in 1970, was more violent than its predecessors in 1967 and 1969. Five maar-like submarine craters and seven land vents along an arcuate zone ~5 km long erupted mugearite tephra and built ~1.5 km2 of new land in the Telefon Bay area. The tephra blanket was salt-rich, suggesting involvement of substantial quantities of sea water (Shultz, 1972). 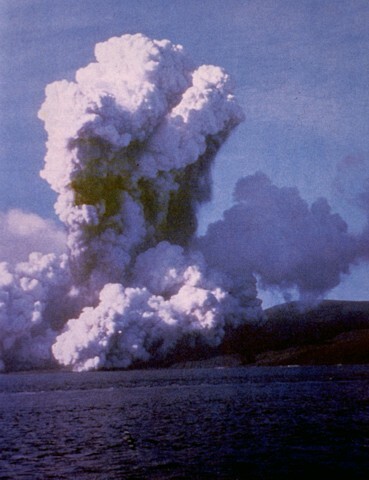 Seismic data suggested that an eruption occurred in September 1972 and a plume was seen on a July 1987 satellite image but neither could be confirmed by ground observations. Reference. 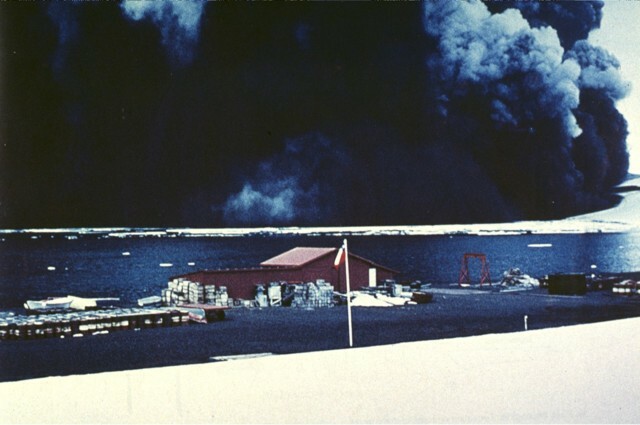 Shultz, C.H., 1972, Eruption at Deception Island, Antarctica, August 1970: GSA Bulletin, v. 83, p. 2837-2842. Information Contacts: R. Ortiz, Museo Nacional de Ciencias Naturales, Spain; C. Risso, Instituto Antártico Argentino; J. Viramonte, Univ Nacional de Salta, Argentina. Seismicity was more vigorous during the 1991-92 austral summer than in previous years and was associated with increased fumarolic activity, gravity changes, and deformation. The following supplements the report in 17:1. Seismic monitoring, with similar instruments at the same locations as in previous years, yielded 766 events between 21 December 1991 and 23 February 1992, many in clusters lasting up to several days (figure 6 and table 1). The most vigorous activity occurred around 10 January and in late January/early February. More than half of the recorded events were followed by another with similar characteristics within an hour. Most had magnitudes of 0.8-2. Of the 15 shocks exceeding this range, four were felt, all were M >3, and all were within 100 km of the station at the Argentine base. RSAM data (figure 6) show both individual events and swarms, but geologists did not believe that the observed acceleration was large enough to suggest that an eruption was imminent. Figure 6. Gravity data (top), Real-time Seismic Amplitude Measurements (RSAM) (middle), and the number of seismic events per day (bottom) recorded at Deception Island, 22 December 1991-24 February 1992. Gravity data are compensated for instrument deflection, which consistently indicated uplift in the direction of Cerro Caliente. Courtesy of Ramón Ortiz. Table 1. Summary of increased seismic activity at Deception Island, December 1991-February 1992. 27 Dec 1991 Felt seismic event (M 3.2). 31 Dec 1991 Seismic crisis preceded by an earthquake with an anomalous high-frequency phase; 3 hours of tremor recorded; local seismic activity reported the next day. 04 Jan 1992 Felt seismic event (M 3.4). 09-10 Jan 1992 Cluster of >150 low-frequency (B-type) and some A-type events occurred very close to the station, probably associated with an increase in fumarolic activity. Steam emission increased in areas with hot soils; a few hours after the seismic crisis ended, the beach between the fumaroles and the hot soils area was covered by a mass of dead krill. 11 Jan 1992 Significant regional earthquake but less local activity (A-type events). 18-19 Jan 1992 Seismic crisis began with tremor and discrete events, accompanied by small irregularities in earth tides (the first swarm during which earth tide and RSAM data were available). At about 0000 on 19 January, the gravimeter showed a sudden variation in the deflection rate, while seismic activity rapidly decreased. After a slight resumption in seismicity, a small (M 1.6) earthquake took place, then the anomalous gravimetric deflection stopped (figure 7). Another large krill mortality was associated with this episode. 25 Jan 1992 Felt seismic event (M 3.3). 30 Jan 1992 Frequent B-type events. 04 Feb 1992 Frequent tremor and B-type events. 16 Feb 1992 About 4 hours of frequent tremor episodes, each lasting 10-20 minutes, separated by quiet periods of similar duration. Great quantities of dead krill, but only around fumaroles. 25 Feb 1992 Tremor felt for about 2 minutes; small seismic events. Figure 7. Gravity data (top) and Real-time Seismic Amplitude Measurements (bottom) recorded at Deception Island, 17-19 January 1992, showing the anomalous gravitmetric deflection associated with the 18-19 January swarm. Courtesy of Ramón Ortiz. Gravity data showed an increase until after the 30 January seismic crisis, then a decrease until the end of monitoring on 22 February (figure 6). Small gravity irregularities corresponded with successive seismic swarms. Compensations in the gravity data were required to allow for deflections that indicated uplift toward Cerro Caliente (figure 8), the area identified as the center of renewed activity. Uplift was visible in the nearby Fumarole Bay area and in the vicinity of the Argentine station, where the helicopter landing field was noticeably tilted. Uplift totaled ~20 cm in the past year. Figure 8. Sketch map of Deception Island, showing the area of recent uplift and new fumaroles, early 1992. Courtesy of José Viramonte. The area of hot soil near Fumarole Bay and Cerro Caliente appeared to be larger than in previous years. Fumarolic emission from the top of Cerro Caliente had increased noticeably, as had the concentration of sulfur compounds in Fumarole Bay. Some of the seismic swarms were associated with deaths of krill (small shrimp-like marine organisms) near fumarolic areas. Geologists noted that the activity . . . could be related to a magmatic intrusion in the main fracture system of the Fumarole Bay area. No acceleration in any of the measured parameters (uplift, earth tides, seismicity, magnetic field, and temperature) was evident, so an eruption was not thought to be imminent. However, the possibility of a small phreatic eruption from the hot area on the beach near Cerro Caliente could not be ruled out. Because the Argentine station is near the potentially active area, an evacuation camp was established in a valley almost 4 km E of Cerro Caliente (in the Crater Lake area) and separated from it by highlands. The valley rises from 15 to 50 m elevation (offering tsunami protection), glaciers are poorly developed above the valley (reducing the risk of lahars), the terrain allows easy helicopter operation, and easily traveled routes lead to the inner coast for possible evacuation by sea. Information Contacts: A. García and R. Ortiz, Museo Nacional de Ciencias Naturales, Spain; C. Risso, Instituto Antártico Argentino; J. Viramonte, Univ Nacional de Salta, Argentina. Activity has declined from the more vigorous behavior seen during the 1991-92 survey to levels recorded during earlier surveys. Only 135 seismic events (M 0.3-0.9) were recorded compared to the 766 events detected during the 1991-92 survey. Episodes of tremor in the NW sector of the island were recorded on 1 January, 2 February, and 16 February 1993. Five deep (55-85 km) earthquakes, M 1.6-2.4, were detected. Fumaroles emitted mainly CO2 (87-98%) and H2S (1.8-13%); no SO2 was detected. Dry-tilt measurements of 600 µrads uplift at Fumarole Bay indicated a slight elevation of the entire fumarolic area. Temperature measurements made by the Spanish Oceanographic Ship "Hespérides" showed a decrease in the intensity of the submarine emissions in Port Foster Bay since the 1990-91 survey. Information Contacts: R. Ortiz, Museo Nacional de Ciencias Naturales, Spain; C. Risso, Instituto Antártico Argentino. The Deception Volcano Observatory (figure 9) was created in 1993, but the volcano has been monitored every summer since 1986. Seismicity remained stable during the austral summer of 1993-94. The decrease in seismic activity seen during 1992-93 from 1991-92 levels continued. Only a few small local seismic events (M 1.5-2) and some larger events (M 2.5, >100 km depth) were detected. Fumaroles emitted mainly CO2 (94.7%) and H2S (3.5%); no SO2 was detected. Fumarole temperatures were similar to previous years near the Argentine Station (60.5°C), in Fumarole Bay (101.2°C), and at Steaming Hill (98.5°C). Figure 9. Map of Deception Island during 1993-94 showing craters, ice cover, the volcano observatory, and locations of monitoring equipment. Equipment near the observatory includes an electronic clinometer, a gravimeter, a magnetometer, and a 3-component seismic station. Courtesy of the Instituto Antártico Argentino. Information Contacts: C. Risso, Instituto Antártico Argentino; R. Ortiz, Museo Nacional de Ciencias Naturales, Spain. Deception has been monitored every austral summer since 1986; its flooded caldera forms a 5 x 9 km bay breached to the SW, giving Deception Island a ring shape. This report describes the 1994-95 summer survey, which included geophysical, geochemical, and volcanological work. Near the Spanish Antarctic station "Gabriel de Castilla" a 500 x 600 m seismic array was deployed. Composed of three, 16-bit digital acquisition systems, the seismic array incorporated the following: 1) a Marck L15B with flat response between 1-48 Hz (12 vertical geophones and 4 horizontal geophones), 2) a Marck L4C with flat response between 0.1-48 Hz (two vertical geophones and four horizontal geophones), and 3) a broad-band, three-component Guralp CMG-3ESP with response between 0.033 and 48 Hz. Figure 10 shows the acquired seismic data, which were collected from 7 December 1994 through 23 February 1995. The seismic data were subdivided into several groups on the basis of their time-domain and frequency-domain appearance. The resulting groups consisted of 262 volcanic tremors, 145 hybrid events, 300 low-frequency events, and 18 high-frequency (local) events (S - P time under 4 seconds). Applying classical array techniques, the preliminary locations for these events suggested that many came from two areas near 'Vapour Hill' (presumably located on the W side of the island at a spot previously designated 'Steaming Hill' on the map in BGVN 19:09). Figure 10. Deception Island seismicity, December 1994-February 1995. Courtesy of Alicia Garcia. A summary of seismic events detected during previous surveys appears in table 2. Although seismic parameters were not always clearly delineated in previous BGVN reports, the seismic events registered in 1991 and 1992 were thought to have been less energetic than in 1994-95. Although the occurrence of earthquake activity was distributed throughout December, January, and February, the team observed at least 10 days with a notable increase in seismicity, days when volcanic swarms had average durations of ~3-6 hours. Given the absence of volcanic activity the researchers suggested that some of the seismicity may be contributed by thermally driven seasonal change. Table 2. A summary of detected seismic events at Deception Island during austral summer surveys. " --" = not reported. Although no data were presented, in addition to reoccupying the local gravimetric net, the magnetic field intensity was continuously recorded using three proton precession magnetometers. Temperatures of fumaroles and hot soils remained stable with respect to those measured in the last survey. The anhydrous component of gases were mainly CO2 (96-99%) and H2S (0.2- 3.9%); SO2 was not detected. Information Contacts: J.M. Ibanez and J. Morales; Instituto Andaluz de Geofísica, Apartado 2145, Univ. Granada, Granada, Spain; A. Garcia and R. Ortiz, Dpto. Volcanologia. Museo Nac. Ciencias Naturales, C.S.I.C., Jose Gutierrez Abascal no. 2, 28006-Madrid, Spain; E. del Pezzo, Dpto. Fisica, Univ. Salerno, Salerno, Italy; C. Risso, Instituto Antartico Argentino, Cerrito 1248, Buenas Aires, Argentina. This report describes the 1995-96 summer survey, which included geophysical, geochemical, geodetic, and volcanological work from 15 December 1995 to 27 February 1996. Monitoring of seismicity was done with a digital seismic array composed of 30 Mark L4C-L25B geophones and a dynamic range of 16 bits. The system was deployed in the same location as the 1994-95 survey, near the Spanish station (BGVN 20:04). This array was more dense than that used in the last survey in order to better cover events with frequencies >10 Hz. More than 600 events were recorded, a level of seismicity similar to 1994-95. However, the average size of these events was smaller than for the previous survey. The events could be classified into several groups: regional seismicity, including intermediate-focus earthquakes; local seismicity, a few earthquakes with S-P time <5 seconds and M <2.5; volcanic tremors; long-period events; and hybrids, volcanic signals that contain long-period events and small earthquakes with S-P time <1 second. Two additional vertical component seismic stations were used, one analog on thermic drum and the other digital with a continuous register system and dynamic range of 24 bits. Regional seismicity was also monitored by another array deployed on Livingston Island, near the Spanish Antarctic "Juan Carlos I" Station, 35 km from Deception Island. Local activity at Deception Island was mainly grouped in several short (no longer than 12 hours) seismic swarms. Continuous recording was made of magnetic field intensity using two Proton magnetometers at Deception Island and a third on Livingston Island used as a reference station. A variometric station was operated with one of the proton magnetometers. The gravimetric and GPS net was re-occupied and the network was enlarged with a new point close to the Spanish "Gabriel de Castilla" station. In order to do a paleomagnetic study some representative rock samples were collected. Systematic monitoring of fumarolic activity continued, and during this survey new areas were measured. Temperatures of fumaroles and hot soils remained stable with respect to those measured in the last survey. Anhydrous gas compositions were mainly CO2 (96-99%) and H2S (0.2-3.9%), with no SO2 detected. Information Contacts: A. García and R. Abella, Departamento de Volcanología, Museo Nacional de Ciencias Naturales, C.S.I.C., José Gutiérrez Abascal No. 2, 28006 Madrid, Spain; J.M. Ibañez, F. Vidal, and J. Almendros, Instituto Andaluz de Geofísica, Apartado 2145, Univ. Granada, Granada, Spain; C. Risso, A. Caselli, and A. Baraldo, Instituto Antartico Argentino, Cerrito 1248, Buenos Aires, Argentina; M. Berrocoso, Real Instituto y Observatorio de la Armada, San Fernando, Cadiz, Spain. The following describes work completed during the 1996-97 austral summer, carried out from 6 December 1996 to 25 February 1997. The survey scientists deployed magnetometer instruments, gravimeters, and a meteorological station. Seismicity (figure 11) was monitored with a digital seismic array with 16-bit dynamic range. The array included 24 geophones (24 Mark L4C-L25b). The array was placed in the same location as the 1994-95 and 1995- 95 surveys (BGVN 20:04 and 21:04) but in addition four additional seismometers were installed in active areas of the island to gather information on the spectral characteristics of the volcanic events. The recorded seismic activity was lower in both energy level and number of events than for the previous years. Figure 11. Daily occurrence of earthquakes at Deception Island, 6 December 1996-25 February 1997. Courtesy of A. García. The recorded events included six intermediate-focus earthquakes, eight regional earthquakes, 13 events with S-P arrival times smaller than 5 seconds and M 2.5, and five volcanic tremors. There were also 119 long-period events and 43 hybrid events, some of which had S-P arrival times under 1 second. Scientists investigated fumarole geochemistry, thermal anomalies, and rock rheology. Temperatures of hot soils remained stable with respect to the last survey. Anhydrous gas compositions were mainly CO2 (96-99%) and H2S (0.2-3.9%), with no SO2 detected. Information Contacts: A. Garcia, M. Astiz, and M. T. Villeguas, Depto. Volcanolog¡a, Museo Nacional de Ciencias Naturales, C.S.I.C. José Gutierrez Abascal 2, 28006 Madrid, Spain; J.M. Ibañez, J. Norales, and E Carmona, Instituto Andaluz de Geofísica, Apartado 2145, University of Granada, Granada, Spain; A. Caselli, G. Badi, and A. Baraldo, Instituo Antártico Argentino, Cerrito 1248, Buenos Aires, Argentina. A Deception Volcano Observatory team has visited the island every austral summer since 1986. In comparison with measurements made during 1996-1997, the temperatures of fumaroles and hot soils generally remained stable: 96-98°C in Fumarole Bay, 64°C in Whaler's Bay, 43°C in Telefon Bay, and 60°C in Pendulum Cove. At Murature Point an increase of more than 20°C produced greater bubbling under the sea, and a large quantity of dead (boiled) krill at the shoreline. Fumarolic gases were mainly composed of CO2 and H2S, similar to previous years. SO2 was not detected. Seismicity was monitored with a digital seismic array having 16-bit dynamic range. The array included 6 vertical-component geophones (Mark L25B) located near the Spanish Antarctic Station Gabriel de Castilla (figure 12). Figure 13 shows seismic data collected from 18 December 1997 to 24 February 1998. A significant component of the seismicity was volcanic tremor of a few minutes to several hours duration totaling 35 hours over the reporting period. Also recorded were 72 hybrid events, 291 long-period events, 12 short-period events, and some regional events generated at 30-100 km distance. Recorded seismicity during this period was greater in both energy and number than in previous years. Figure 12. Map of Deception Island, showing fumaroles (*) and hot soils (~) in 1998. Courtesy of C. Risso. Figure 13. Seismicity at Deception Island, December 1997-February 1998. Courtesy of R. Abella. Information Contacts: C. Risso, Observatorio Volcanológico Decepción, Instituto Antártico Argentino-UBA, Cerrito 1248 (1010) Buenos Aires, Argentina; A. García, R. Abella, and J. Peña, Dpto. Volcanologia, Museo Nacional de Ciencias Naturales-CSIS, José Guiterrez Abascal 2, 28006 Madrid-Spain; E. Vélez, Instituto de Astronomía y Geodesia-CSIS, Madrid-Spain; F. Navarro, Escuela Superior de Ingenieros de Telecomunicaciones-U.P.M., Madrid, Spain. Deception Island has been monitored during every austral summer since 1987. In December 1998, a new seismic network was deployed to monitor activity at Deception as part of the Spanish Antarctic Research Project. The following is a preliminary report on findings of the project. A final, comprehensive report will be finished in March 1999. Significant seismic episodes, including several kinds of seismic signals, were recorded during the period 3-24 January. In summary there were 720 volcano-tectonic earthquakes, 417 long-period events, and volcanic tremor lasting 20 hours. Most of the earthquakes had magnitudes close to one, and only six had magnitudes more than three. Two earthquakes were felt by the Spanish team working at the Spanish Antarctic Station "Gabriel de Castilla" on Deception Island. These occurred on 10 January (M 3.3) and 20 January (M 4.3), and both were located in the NE of the island. Seismic events are recorded, quantized, and located on the island by Spanish researchers who regularly send back information. They suggest January's activity has been at a higher level than during any previous survey, with the exception of levels recorded during the 1991-92 campaign (BGVN 17:04). The temperatures of anomaly areas (fumaroles and thermal soils) have been periodically measured, but no significant variation has been detected. Information Contacts: Alicia Garcia and Ramon Ortiz, Dpto. de Volcanologia, M.N.C.N.-C.S.I.C. Jose Gutierrez Abascal 2, 28006 Madrid, Spain; Jesus Ibañez, Gerardo Alguacil, and Jose Morales, Instituto Andaluz de Geofísica, Univ. Granada, Spain; Edoardo del Pezzo, Osservatorio Vesuviano, Napoli, Italy; Javier Almendros, Enrique Carmona, Jose Peña, and Gilberto Sacorotti, Spanish Antarctic Station "Gabriel de Castilla," Deception Island. Deception has been monitored for part of every austral summer since 1987; its flooded caldera forms a 5 x 9 km bay that is breached to the SW, giving Deception Island a ring shape. In December 1998, as part of the Spanish Antarctic Research Project, a new seismic network was deployed to monitor activity on the island. The instrumentation included two seismic antennas and two continuous-recording stations. The latest seismic survey was conducted under the auspices of the Spanish Antarctic Project; it revealed a significant increase in the daily number of seismic events (i.e., volcano-tectonic (VT) earthquakes, volcanic tremor, and long-period (LP) events when compared with activity recorded during previous summer field surveys. The noteworthy increase started in early January 1999 (BGVN 24:01) and continued in February (figure 14). Figure 14. Change in the number of seismic events during 31 December 1998-19 February 1999 at Deception Island. Earthquakes shown encompass long period (LP) and volcano-tectonic (VT). Courtesy of the Spanish Antarctic Research Project. The active area is in a region between Fumarolic Bay and Murature Point and the seismic activity appears to be located near the boundary of the geological structure activated by the 1970 eruption. Members of the project interpreted these observations in the following manner: A fresh intrusion of magma occurred at a depth of ~500 m. The VT earthquakes are the brittle response of the shallow structure surrounding this injection, and the LP events and volcanic tremor result from the interaction of the shallow aquifer of the island with this injection of hot material. This implies a significant evolution of activity, marked by a change from stable stationary geothermal processes to a more dynamic intrusive process. Information Contacts: Jesus Ibañez, Gerardo Alguacil, José Morales, José Peña, Javier Almendros and Enrique Carmona, Instituto Andaluz de Geofísica, Univ. de Granada, Spain; Alicia Garcia and Ramón Ortiz, Dpto. de Volcanologia, MNCN-CSIC, José Gutierrez Abascal 2, 28006 Madrid, Spain; Edoardo del Pezzo and Marcello Martini, Osservatorio Vesuviano, Napoles, Italy; Bernard Chouet, USGS, Menlo Park, CA 94025 USA; Gilberto Saccorotti, Univ. Salerno, 84100 Baronissi (Salerno), Italy. During the most recent austral summer, December 2000-March 2001, the Spanish Antarctic Programme (SAP) carried out its yearly survey of Deception Island. Researchers from Spain, Italy, and México took part in the seismological, magnetic, and geochemical study of the entire island. The seismic network's stations were deployed in a variety of configurations (figure 15). The instruments used were as follows: two dense seismic antennas each with 16 short-period seismometers, two small antennas each with four seismometers, three short-period seismometers, two broadband seismic stations, and four autonomous three-component short-period seismic stations. Figure 15. Seismic instruments deployed in the December 2000-March 2001 field survey of Deception Island. Seismic arrays are detailed in large squares. Courtesy of SAP. Seismicity is summarized in figure 16. Registered seismic events featured volcano-tectonic earthquakes (VT), a few episodes of volcanic tremor, long-period events (LP), and hybrid events (VT + LP). More than 75 VT, 500 LP, and 20 hybrid events were recorded; this constituted moderate activity compared to previous surveys. Hybrid events, which were difficult to detect in previous studies, peaked at the end of January 2001. Volcanic tremor episodes occurred with durations between hours and a few days; workers interpreted these events, together with the LP events, as a consequence of hydrothermal activity. Figure 16. Histogram of the volcano-tectonic (VT), long period (LP), and hybrid events recorded during 20 December 2000-15 February 2001. Courtesy of SAP. The magnetic field in the area was monitored using a proton magnetometer deployed near the Argentinean base, which is the position used in previous surveys (figure 17). The recorded values of the magnetic field are being processed and corrected according to external variations in order to observe whether volcano-magnetic effects produced variation in the local magnetic field. Figure 17. Map showing morphological features, bases, and the sites selected to measure CO2 flux. Courtesy of the SAP. Geochemical investigations consisted of recording gas composition and temperature of the fumaroles in Fumarole Bay and measuring CO2 flux at 26 points around the island (figure 16). The chemical analyses of the fumarolic samples are being processed. Fumarole temperatures averaged ~100°C, similar to values of previous years. The majority of points, including those bordering Fumarole Bay, had a very low flux of CO2. Two of them, however, Murature Point and Cerro Caliente hill (figure 17), had high fluxes. Future studies will conduct similar surveys in order to establish a CO2 flux map for the entire island. Information Contacts: Alicia García and Ramón Ortiz, Dpto. Volcanología, Museo Nacional de Ciencias Naturales, CSIC, José Gutierrez Abascal 2, 28006, Madrid, Spain; Jesús M. Ibáñez, Enrique Carmona, José Benito Martín, and Carmen Martínez, Instituto Andaluz de Geofísica, Apartado 2145, University of Granada, 18071 Granada, Spain; José Luis Pérez-Cuadrado, Universidad de Cartagena, 30202 Murcia, Spain; Mauricio Bretón, Universidad de Colima, Colima, Col., 28045, México; Mario La Rocca, Osservatorio Vesuviano, Via Diocleziano 328, 80124 Napoli, Italy. The Deception Volcano Observatory has monitored the volcano every austral summer since 1993. Investigations of fumarole geochemistry, thermal anomalies, and volcanic activity were made during the summer survey of 2000 and 2002 by the Argentina Research Group. Compared to measurements made during the latest surveys, temperatures of fumaroles and hot soils remained stable at 99-101°C in Fumarole Bay, 97°C on Caliente Hill, 65°C in Whalers Bay, 41°C in Telefon Bay, and 70°C in Pendulum Cove (figure 18). Figure 18. Map of Deception Island showing the area of geothermal anomalies during austral summer 2002. Courtesy of A.T.Caselli, M. dos Santos Afonso, and M. Agusto. Following a possible magma intrusion during the summer of 1999 (BGVN 24:05), the composition of gases from fumarolic vents at Fumarole Bay changed compared to previous surveys. The chemical composition of the fumarolic gases was mainly H2O (70-95 vol. %), CO2 (5-30%), H2S (0.1-0.3%), and SO2 (0.01-0.08%). For the first time, SO2 was detected. Elemental sulfur and iron sulfide coatings on lapilli were found around the vent outlets and at a few centimeters of depth, respectively. Elemental sulfur and iron sulfide occurrences were intermittent during the 2000 and 2002 summer surveys. Information Contacts: A.T.Caselli, M. dos Santos Afonso, and M. Agusto, Universidad de Buenos Aires, Instituto Antártico Argentino, Ciudad Universitaria, Pabellón 2, C1428EHA Buenos Aires, Argentina. While fieldwork was conducted during 1 December 2002-18 April 2003, Spanish and Argentine scientists measured Deceptions Island's seismicity, thermal activity, and gas emissions. Gravimetric field surveys, geodetic measurements, and geological studies were also carried out. Monitoring during 2002-2003. During the 2002-2003 Antarctic summer the scientists installed two dense seismic antennas in trigger mode and four continuous-recording short-period stations (figure 19). Each of the antennae were composed of eight short-period seismometers with apertures of ~250 m. One was located at the Argentinean Base and the other in Pendulum Cove. Three vertical-component seismometers were located on the N side of Fumarole Bay, at the beach between Murature Point and Cross Hill, and near 70'Craters. Finally, a three-component seismic station was installed near the Spanish Station. Figure 19. Map of Deception Island indicating seismic stations, antennas, fumaroles, and geothermal anomalies measured during 1 December 2002-18 April 2003. Courtesy of A. T. Caselli. Temperatures of fumaroles and hot soils remained stable at 99-101°C in Fumarole Bay, 95°C in Caliente Hill, 65°C in Whalers Bay, 41°C in Telefon Bay, and 72°C in Pendulum Cove (figure 19). Fumarolic activity was also monitored, with radon measurements being made for the first time. Standard wet-analysis techniques revealed that the composition of gas obtained from the vents at Fumarole Bay was similar to that of recent years, namely H2O(v) (70-95%), CO2 (7-29%), H2S (0.12-0.39%), and SO2 (0.01-0.07%). Elemental sulfur was seen around the vent outlets, and pyrite with lapilli coatings were found at a few centimeters depth. Information Contacts: A.T. Caselli, M.R. Agusto, and L. Ferreyra, Universidad de Buenos Aires-Instituto Antártico Argentino, Ciudad Universitaria, Pab.2, (1428) Buenos Aires, Argentina; Jesús Ibáñez, Daria Zandomeneghi, Daniel Stich, Francisco Carrión, and Javier Almendros, Instituto Andaluz de Geofísica, Universidad de Granada, 18071-Granada, Spain. Deception Island is the most active volcano in the Antarctic Peninsula region. A team of Spanish-Argentine scientists collected data from 25 November 2003 to 16 March 2004 in order to provide background activity records. Local and regional seismicity, thermal activity, gas emission, geodetic, and geological studies were carried out. During this survey, one seismic antenna and three continuous-recording stations were installed (figure 20). One dense seismic antenna with twelve vertical-component short-period seismometers was located between the Spanish and Argentine base stations, one vertical-component short-period seismometer was placed at North Fumarole Bay (with telemetry), and three-component short-period seismic stations were installed near both the "Gabriel de Castilla" Spanish station and the Argentine station. Figure 20. Seismological stations deployed at Deception Island in 2003-2004 summer survey. Courtesy of the Spanish-Argentine research team. The recorded seismicity included long-period events (LP), volcanic-tremor episodes (T), and a few volcano-tectonic earthquakes (VT). More than 3,660 LP events events were recorded (figure 21), 35 of them with hybrid character, and many with frequencies of 1-8 Hz. Eight volcanic tremors occurred with durations ranging from less than one hour to twenty-one hours; 66 VT earthquakes were also recorded. Four remarkable periods of activity were detected in this survey, during last December, mid-January, early February, and mid-March. All of these periods were characterized by a relatively high level of seismic activity with frequent LP events and tremor. Most earthquakes recorded during the field season were located inside the island, and these events have been closely related with LP and tremor events. Earthquakes with S-P wave time lags of less than 3 seconds were classified as local or VT, with local magnitudes of up to 2.0, none of which were felt. LP seismicity might be related to thaw water (seasonal effect) but this year's anomalous activity could also be due to strong pressurization in a sealed system. Figure 21. Long-period seismic activity at Deception Island during the 2003-2004 summer survey. Adapted from a histogram showing six types of recorded seismicity. Courtesy of the Spanish-Argentine research team. Fumarole temperatures and hot soils remained stable between 99 and 101°C in Fumarole Bay, 95°C in Caliente hill, 65°C in Whalers Bay, 41°C in Telefon Bay, and 72°C in Pendulum Cove. Systematic monitoring of fumarolic activity continued as in past years, and during this survey radon was measured. Samples of condensable and uncondensable acid gases were collected. The obtained composition from the fumarole vents at Fumarole Bay was similar to previous years. The average chemical composition of the fumarolic gases was H2O(v) (86.21%), CO2 (13.59%), H2S (0.19%), and SO2 (0.01%). Lapilli with a coating of pyrite were found around vent outlets. Compositional changes in acidic gases observed in early February and March 2004 correlated with increased seismicity, especially with LP events. Information Contacts: A.T. Caselli, C. Bengoa, and E. Rojas Vera, Universidad de Buenos Aires-Instituto Antártico Argentino, Ciudad Universitaria, Pab.2, (1428) Buenos Aires, Argentina; A. Bidone and G. Badi, Dpto. de Sismología e I.M., Facultad de Cs. Astronóm. y Geofísicas, UNLP, Av. Centenario s/n Paseo del Bosque, B1900FWA La Plata, Pcia. de Buenos Aires, Argentina; Daria Zandomeneghi, Nieves Sánchez, Fermín Fernández-Ibañez, and Jesús Ibáñez, Instituto Andaluz de Geofísica y P.D.S. Universidad de Granada, Campus Universitario de Cartuja, s/n 18071, Granada, Spain. Alicia Garcia forwarded to us a report of the geophysical monitoring conducted during December 2008 to February 2009 (the 2008-2009 austral summer). This field work included measurements of seismicity, deformation, and soil temperature. Little if any unrest was detected. The volcanic alert remained Green during the 2008-2009 campaign. The volcano last erupted in 1970 (and several uncertain eruptions were indicated since then). Seven seismic stations, and a seismic array determined that seismicity was low. During January and February 2009 instruments detected some earthquakes attributed to hydrothermal processes and ice melting. Geodetic leveling surveys were carried out over benchmarks along six lines of an existing network (known as RENID). Only superficial deformation was detected. The Thermometric Monitoring Network (THONET) was initiated in 2006. It consists of a set of stations monitoring micro-meteorological variables including wind velocity, air temperature and humidity, upward and downward solar and terrestrial radiation, diffuse solar radiation, soil heat flow, soil temperature at several depths and snow depth cover. Not all variables are recorded at all stations or constantly. Measurements indicated that soil thermal behavior was the result of solar and atmospheric forcing. Ibanez and others (2003) noted both long-period (LP) and volcano-tectonic (VT) earthquakes since 1986, with greatest intensity during 1992 and 1999. This means that in ~ 15 years of seismic monitoring, two intense volcanic crises have been observed. No permanent monitoring stations exist on the island, and seismic measurements are conducted only during 3 months/year (from December to February); thus, similar periods of elevated volcanic seismicity might have occurred more often than detected. Benitez and others (2007) described a seismic-event classification and monitoring system for Deception. The system, based on hidden Markov modeling (HMM) techniques, enabled monitoring by careful discriminating among different signal types. As late as 30 April 2009, MODIS/MODVOLC thermal alert satellite measurements showed no anomalies over the island since at least 2000. References. Benítez, M.C., Ramírez, J., Segura, J.C., Ibáñez, J.M., Almendros, J., García-Yeguas, A., and Cortés, G., 2007, Continuous HMM-Based Seismic-Event Classification at Deception Island, Antarctica, IEEE Transactions on Geoscience and Remote Sensing, v. 45, no. 1, p. 138-146. Ibáñez, J.M, Almendros, J., Carmona, E., Martínez-Arévalo, C., and Abril, M., 2003, The recent seismo-volcanic activity at Deception Island volcano, Deep Sea Research Part II: Topical Studies in Oceanography, v. 50, no. 10-11, p. 1611-1629. Information Contacts: A. Garcia, Dept. of Volcanology (MNCN-CSIC), Madrid, Spain; M. Berrocoso, Cadiz Univ., Spain; M. Rodríguez-Arias, Extremadura Univ., Spain; I. Serrano, Granada Univ., Spain; MODIS/MODVOLC. Hawai'i Institute of Geophysics and Planetology (HIGP) Thermal Alerts System, School of Ocean and Earth Science and Technology (SOEST), Univ. of Hawai'i, 2525 Correa Road, Honolulu, HI 96822, USA (URL: http://modis.higp.hawaii.edu/). Ring-shaped Deception Island, one of Antarctica's most well known volcanoes, contains a 7-km-wide caldera flooded by the sea. Deception Island is located at the SW end of the Shetland Islands, NE of Graham Land Peninsula, and was constructed along the axis of the Bransfield Rift spreading center. A narrow passageway named Neptunes Bellows provides entrance to a natural harbor that was utilized as an Antarctic whaling station. Numerous vents located along ring fractures circling the low, 14-km-wide island have been active during historical time. Maars line the shores of 190-m-deep Port Foster, the caldera bay. Among the largest of these maars is 1-km-wide Whalers Bay, at the entrance to the harbor. Eruptions from Deception Island during the past 8700 years have been dated from ash layers in lake sediments on the Antarctic Peninsula and neighboring islands. Aristarain A L, Delmas R J, 1998. Ice record of a large eruption of Deception Island volcano (Antarctica) in the XVIIth century. J. Volcanol. Geotherm. Res., 80: 17-25. Baker P E, McReath I, Harvey M R, Roobol M J, Davies T G, 1975. The geology of the South Shetland Islands: V. Volcanic evolution of Deception Island. Brit Antarctic Surv Sci Rpt, 78: 1-81. Bjorck S, Sandgren P, Zale R, 1991. Late Holocene tephrochronology of the northern Antarctic Peninsula. Quat Res, 36: 322-328. Marti J, Baraldo A, 1990. Pre-caldera pyroclastic deposits of Deception Island (South Shetland Islands). Antarctic Sci, 2: 345-352. Roobol M J, 1973. Historic volcanic activity at Deception Island. Brit Antarctic Surv Bull, 32: 23-30. Roobol M J, 1979. A model for the eruptive mechanism of Deception Island from 1820 to 1970. Brit Antarctic Surv Bull, 49: 137-156. Smellie J L, 2000. Lithostratigraphy and volcanic evolution of Deception Island, South Shetland Islands. Antarct Sci, 13: 188-209. Weaver S D, Saunders A D, Pankhurst R J, Tarney J, 1979. A geochemical study of magmatism associated with the initial stages of back-arc spreading. Contr Mineral Petr, 68: 151-169. There is data available for 30 Holocene eruptive periods. There is no Deformation History data available for Deception Island. There is no Emissions History data available for Deception Island. An eruption plume rises above Telefon Bay on the north side of the caldera bay on December 4, 1967. The eruption originated from four aligned vents and formed a new island, named Yelcho. During the peak of activity, the eruption plume rose 10 km above the vent. Ashfall occurred across Port Foster caldera bay and throughout the Shetland Islands. A subaerial vent NW of Pendulum Cove 2.5 km to the east was also active. The eruption ended on December 7. Photo by British Antarctic Survey, 1967 (published in González-Ferrán, 1995). Steam rises above vents of a new island formed during an eruption in Telefon Bay December 4-7, 1967. 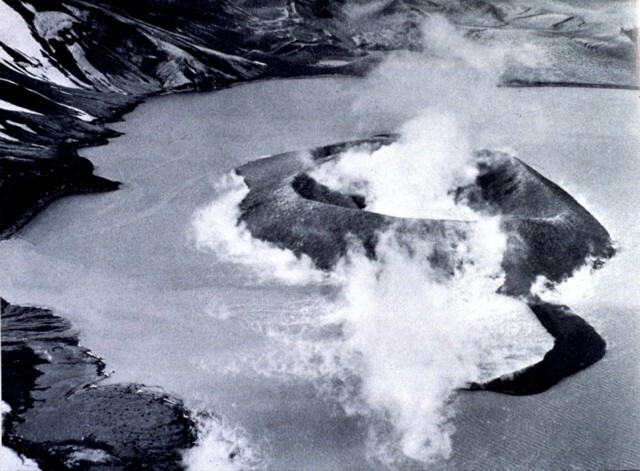 The eruption occurred from four vents along a NE-SW line cutting across the bay and created a 1-km-long, 65-m-high island, which was named Yelcho, after a research vessel that was at Deception Island at the time of the eruption. Fumarolic activity continued for several years from the 1967 vents. Following an eruption in 1970, the new island was joined to Deception Island. Photo by the Chilean Navy, 1967 (published in González-Ferrán, 1995). A dark, broad ash-laden eruption plume towers above a line of vents only 2 km east of the Chilean research station at Pendulum Bay on December 4, 1967. Heavy ashfall from the eruption deposited 30 cm of ash on the Chilean base, collapsing the roof of the station. Members of the research party walked 6 km south to safety at another research station on the opening day of the eruption and were evacuated by helicopter the following day. The Global Volcanism Program has no maps available for Deception Island. The following 21 samples associated with this volcano can be found in the Smithsonian's NMNH Department of Mineral Sciences collections, and may be availble for research (contact the Rock and Ore Collections Manager). Catalog number links will open a window with more information. Large Eruptions of Deception Island Information about large Quaternary eruptions (VEI >= 4) is cataloged in the Large Magnitude Explosive Volcanic Eruptions (LaMEVE) database of the Volcano Global Risk Identification and Analysis Project (VOGRIPA).